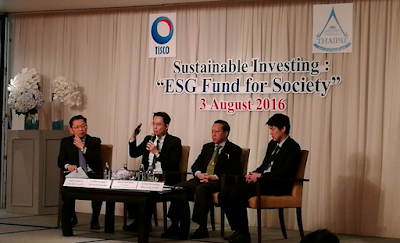 3 August, 2016 – TISCO and Thaipat Institute jointly held the Exclusive Tea Talk “Sustainable Investment: ESG Fund for Society” today to promote Philanthropic Investment; The new band in the investment spectrum focuses on outstanding ESG (Environmental, Social and Governance) listed equities investing seeking returns to support CSR programs, while the invested principle stays intact, which is more sustainable than philanthropy. In support of Thaipat’s Philanthropic Investment initiative, TISCO has now presented the TISCO ESG Investment Fund for Society. This fund has invested in the securities of ESG100 firms for the purposes of giving corporate investors the regular returns and able to continue their CSR activities on a sustainable basis. Dr.Pipat Yodprudtikan, director of Thaipat Institute, says Philanthropic Investment is a new investment concept that broadly embraced in worldwide SRI communities. This is a long-term investment strategy focuses on one or a cluster of ESG issues where investment opportunities create environmental and/or social impact while invested capital stays intact, with investment returns being used for public benefits or CSR activities. It is different from Philanthropy or donations, where social and/or environmental contribution requires zero return and loss of the principle. Philanthropic Investment presents a good alternative for corporations. With a proper plan, enterprises will be able to allocate one-off resources, and generating reap returns to support their CSR programs in the long run. Today, the growing trend of socially responsible business conduct provides choices to investors not only financial data, but also ESG information to incorporate in investment decision and analysis. Thaipat Institute has compiled the list of ESG100 to facilitate investments in ESG-embracing firms. The ESG100 is the list of listed companies that are screened on both outstanding operating results and ESG practices. The ESG100, in all, provides investors a choice of good listed equities in the Stock Exchange of Thailand. ““Thaipat Institute unveiled the first ESG100 list in Thailand last year. On the list are top 100 ESG-outstanding publicly listed companies ranked by the corporate sustainability criteria. Early this year, we have brought our ESG100 list to a new height. We have integrated financial data to our screening criteria so as to make sure the ESG100 list presents good business performance and ESG practices of the companies that also generate returns not less than market return rates,” Dr.Pipat adds. Mr.Theeranat Rujimethapass, managing director of TISCO Asset Management, says Thaipat’s Philanthropic Investment initiative is in-line with TISCO’s corporate sustainability policy, therefore, we have supported the initiative by setting up TISCO ESG Investment Fund for Society (TISESG-S). The fund has put listed securities from the ESG100 universe in its portfolio. By leveraging TISCO expertise, the fund is expected to generate market-rate returns for investors so that they can allocate those returns on their CSR activities on a sustainable basis in accordance with the Philanthropic Investment concept. In the TISCO’s view, business conducts with good ESG practices have been relatively less volatile. They have had lower systematic risks (Beta) and higher potential to achieve excess returns (Alpha) in the long run relative to the return of a benchmark index. “We believe that investments in ESG-embracing firms will result the returns that are no lower than traditional investments. During the past five years (June 30, 2010 – July 10, 2015), total returns of SET Index are at 123%. But within the ESG100 universe, total returns are at 160%. Standard deviation from the ESG100 universe is at 13.95% while SET index is at 16.07%. In other words, ESG100 securities offer a higher return, also less volatility,” Mr.Theeranat adds. Mr.Sombat Kittipokiratana, assistant managing director of L.P.N. Development Public Company Limited, says his firm is among those investing in the TISCO ESG Investment Fund for Society during its initial public offering. Also in the first batch of investors are TISCO group, BTS Group Holdings, Minor Group, Khon Kaen Sugar Industry and Nam Seng Insurance. According to Mr.Sombat, L.P.N. Development is committed to developing low-end and medium-end condominium projects based on the “Vibrant Communities” concept. Guided by Triple Bottom Line, 6 Green L.P.N., 8 Stakeholders and 10 Processes, the firm has operated its business in pursuit of Sustainable Development. L.P.N. Development has decided to invest in the TISCO ESG Investment Fund for Society and has planned to spend the returns on its social contribution or CSR activities according to its underlying vision and mission, and aligning with its business conducts on ESG principles. L.P.N. Development’s CSR efforts also include the project to raise underprivileged women’s quality of life. Corporate investors who interested in “TISCO ESG Investment Fund for Society”, please carefully study the fund, conditions, and associated risks prior to making investment decisions. For more information or prospectus, please contact TISCO Asset Management or TISCO Bank, or reach the TISCO Contact Center at 02-633-6000 press 4.